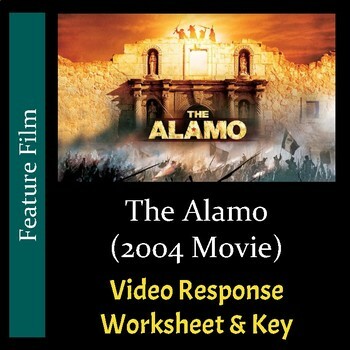 This Video Response Worksheet and Key is based on the 2004 movie "The Alamo" starring Dennis Quaid. This movie is approximately 2 hour 17 minutes long. In 1836 Gen. Sam Houston (Dennis Quaid) organizes a rebel army to liberate Texas from the brutal rule of Mexican dictator General Santa Anna (Emilio Echevarría). Though vastly outnumbered, Gen. Houston's volunteer army includes such folkloric figures as Jim Bowie (Jason Patric) and Davy Crockett (Billy Bob Thornton). As Santa Anna's forces advance on San Antonio, the legendary general and his men prepare for a final heroic standoff at a battle-worn mission called the Alamo.